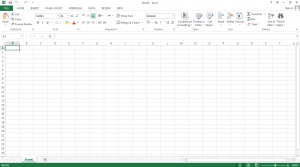 While using Microsoft Excel is routine in a wide variety of settings, many people are totally confused by the program. Spreadsheets are crucial elements of any business, but the complexities of programs like Excel make people cringe. Although newer versions are, arguably, easier to use than versions of the past, they are still difficult for novice users. There are, however, some Microsoft Excel Tips that make spreadsheets simpler for even novice users. When users wish to select all the data in a specific spreadsheet, simply click on the starting row and press F8. That will activate the function. From there, move to the end of the spreadsheet and click on the last cell. To deactivate the function, click on F8 again. A common issue is not being able to view all the contents of a cell. This is especially true when text is entered. To widen the column, simply highlight it. Move the pointer to the edge of the column. When the plus sign is visible, drag the line to a point where the contents can be seen. 3. Hide columns or rows. Spreadsheets are often huge documents containing an amazing amount of data. However, the shear volume of data can actually hinder some chores. When users only require data from selected columns or rows, it is quite easy to hide data not currently needed. To hide a row, press “ctrl” and “9”. To reverse the process, hit “ctrl”, “shift” and “9” to make the row visible again. To hide columns, hit “ctrl” and “0”. To reverse the process, hit “ctrl”, “shift” and “0”. 4. Use colors to make spreadsheets more readable. Colors make spreadsheets more attractive and easier to read. Users can select a color scheme by going to Page Layout and choosing a new color scheme from the Colors box. The process is simple and makes spreadsheets much easier on the eyes. There are countless shortcuts to make using Excel easier and more efficient. Once users understand a few basics, using shortcuts will be simplified. The key to learning Excel Tips And Tricks is to explore the menus while using the program to see the many options available. While tutorials are helpful, using a real spreadsheet provides additional learning opportunities. To avoid losing data, copy an actual spreadsheet and explore different shortcuts and functions without the risk of losing data.